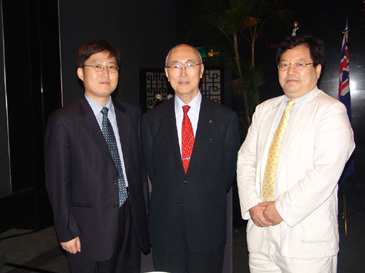 Dr. Kwan Rim (center) poses with Amb. 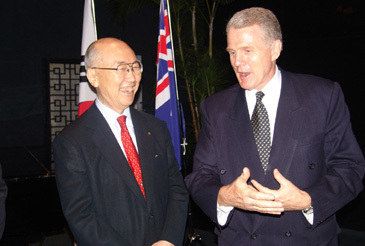 Colin Stuart Heseltine (3rd from right) of Australia, Amb. David Taylor (3rd from left) of New Zealand, and other VIPs at ANZCCK Aug. Breakfast Forum. 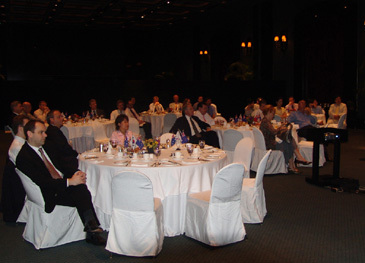 ANZCCK Chairman Les Edwards hosted "ANZCCK August Breakfast Forum" at Grand Hyatt Hotel's Regency Room on Aug. 9, 2005. Dr. Kwan Rim, chairman of the Samsung Advanced Institute of Technology, delivered a speech under the title of "Technological Innovation & International Cooperation: Challenges for Korean Industry." 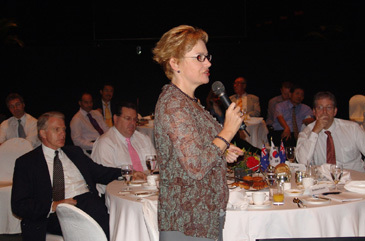 The breakfast and the forum took place between 8 a.m. and 9:30 a.m. Scores of local and foreign businessmen came to listen to Dr. Rim's speech. Amb. 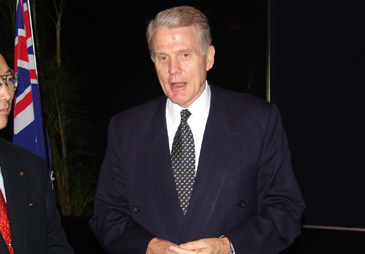 Colin Stuart Heseltine of Australia and Amb. David Taylor of New Zealand also attended the early morning gathering along with ANZCCK members. 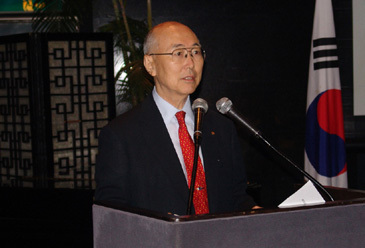 The following is the full text of Chairman Kwan Rim of Samsung's Advanced Institute of Technology (SAIT), who spoke on "Technological Innovation & International Cooperation: Challenges for Korean Industry" at "ANZCCK August Breakfast Forum" at Grand Hyatt Hotel's Regency Room on Aug. 9, 2005. 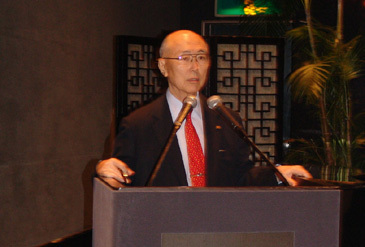 Dr. Kwan Rim, chairman of the Samsung Advanced Institute of Technology, speaks at ANZCCK's August Breakfast Forum. Abstract: This paper begins with a brief review of social evolution and paradigm shift, for the purpose of highlighting the essence of the new challenges that the Korean industry must face. The key recommendations directed to the Korean policy makers are (1) acceleration of human resource development, (2) invigoration of technological innovation, and (3) enhancement of international cooperation through global networking. Consider one of the pressing issues of today; namely, the unemployment problem of the world, at the juncture of transition from the industrial to the knowledge-based economy. Governments are trying their utmost to attain both stable employment and steady economic growth, as they are the basic pre-requisites for the citizens in their pursuit of happiness. However, the outcome of these governmental efforts has been disappointing. Unemployment persists at an unacceptable level. And it has become clear that our conventional wisdom and traditional methods of solution may no longer be adequate. 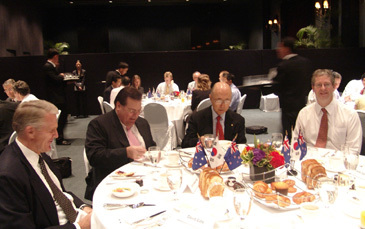 Dr. Kwan Rim (2nd from right) sits at head table with other VIPs. In fact, some radical changes are taking placed with our transition into the knowledge-base economy. And it has become imperative that we take these paradigm shifts into account, whenever we cope with the techno-economic issues of today. Accordingly, the list of top priority action items for Korea now appears as: (1) acceleration of human resource development, (2) invigoration of technological innovation and (3) enhancement of international cooperation through global networking. In recognition of this paradigm change, the Korean government has recently committed itself to develop a science- and technology- centered society on this peninsula. This paper presents a brief review of social evolution and paradigm shift, with a summary of the distinguishing characteristics of the knowledge-based society. A number of international comparisons are also presented for the purpose of making illustration. Amb. David Taylor of New Zealand attends at ANZCCK meeting. The history of our civilization may be readily associated with that of the representative tools (instruments of civilization) of each period; e.g., tools made of stone in the Stone Age. Computers have played the leading role in ushering in the Modern Age, which may even be called the Digital Genomic Era. New tools and technologies have brought about the social progresses as we know them; i.e., thousands of years of the agricultural society, one and a half centuries of the industrial society, and the recent advent of the knowledge-based society. The most valuable resources in each economy have changed dramatically; namely, land and labor in the agricultural society, capital and labor plus technology in the industrial society, and now our brain power in the knowledge-based society. If mass production and expanded physical capability of human being were the essence of the industrial economy, networking and expanded mental capacity of human being would be the distinguishing features of the knowledge-based economy. It is interesting to note that in the middle of the 18th century when the world was still under the agricultural economy, the ratio of the productivity per capita between the richest and the poorest country was only five to one. This ratio passed over 100 to one in the midst of the industrial economy. And now at the early phase of the knowledge-based economy, it is over 300 to one. And it is expected to rise higher. This disparity will worsen not only between countries but also between citizens of a given nation. The rapid change from the industrial society to the knowledge-based society had significant influence on the composition of the three major categories of businesses of the world; i.e., agriculture, manufacturing, and service. In 1960, the ratio of the three businesses was 30 percent agriculture, 32 percent manufacturing, and 38 percent service, which was well balanced over the whole business. However this ration changed dramatically by the end of the 20th century: 6 percent agriculture, 32 percent manufacturing, and 62 percent service. As time goes on, the share of manufacturing business is expected to shrink particularly in a country like Korea, which is quite susceptible to the dilemma of manufacturing. This dilemma refers to the dropping of the price of manufactured goods and the steady rising of the labor cost. Due to mass production system, the price of manufactured goods was and will keep dropping, while the cost of labor will rise steadily. For example, the price of color TV has dropped from $1,000 in 1954 to less than $180 now. In case of VCR, its price dropped form $1,395 in 1978 to about $80 in 2001. Same was true with cellular phones. Even the commodity price has plummeted to one fifth on the average during the last century. Contrary to the tendency of dropping prices of manufactured goods, the wages of workers have increased steadily. Korean's average hourly wage was $0.32 in 1975. It has increased to $6.71 by 1999, 22 times larger than in 1975. It is obvious that the dilemma of manufacturing can not be resolved by the recipe for the old paradigm, such as cost reduction, productivity enhancement, restructuring, etc. An appropriate recipe for the new paradigm must be sought. Ms. Elizabeth Masamune, senior trade commissioner of Australian Trade Commission questions at ANZCCK meeting. A key word for the knowledge-based economy is 'digital.' The information and communication sector, simply called IT or ICT, is growing rapidly. The speed of network is increasing. Digitalization of contents and multimedia innovation are progressing at an accelerated pace. Continuous development of network from telephone via cellular phone to high speed wireless internet enables seamless transfer of comprehensive multimedia contents. The development from an analog TV to a digital TV demonstrates the improvement in the quality of multimedia contents. Now the overall trend of development in the ICT sector is directed to a digital convergence, which means the gathering of all functions into one mobile terminal. Another leading trend accompanying digital technology is miniaturization. The tendency of miniaturization is well reflected by such terminologies as MEMS, NANO, and so forth. Now, let us take a glimpse of a knowledge-based economy in action in the United States, in order to augment our comprehension of the new paradigm. The U.S. is one of the front runners. The first thing we observe is an explosive increase of knowledge as measured by the number of patents. The number of registered patents in the U.S. increased from 62,000 in 1980 to 182,000 in 2000, more than three times larger than in 1980. Secondly, it is expected that the U.S. high-tech industry's contribution to her GDP should grow from 4.4 percent in 1996 to 21.1 percent in 2006. It means an amazing five-fold growth in GDP contribution in just a decade. Dr. Kwan Rim poses with Mr. Kim Sung-Chul, manager of Samsung Advanced Institute of Technology, and Mr. Joseph Joh, managing editor of The Seoul Times at ANZCCK meeting. The list of promising high-tech industries in the U.S. includes Genomics, Bioinformatics, Software, Aerospace, Nanotechnology, Photonics, Micro Materials, Finance, IT, Ubiquitous Computing, Robotics, and Entertainment. They are those industries usually classified as knowledge intensive. A review of the rank change of the wealthiest people in the U.S. is also instructive. In 1986 the three wealthiest individuals in the U.S. were Walton in retail sale, Mars in food industry, and John Kluge in media industry, and Sam Walton's fortune at that time was around $4.5 billion. Some 14 years later, the three wealthiest persons in the U.S. were Bill Gates, Larry Ellison, and Paul Allen. All three of them were in software business, and Bill Gate's fortune amounted to about $60 billion. Common among the three richests in 2000 was their comprehension of the dominant code: Digital Code. What dominant code should we expect to see after the Digital Code? Many experts in the area of Bio-Technology predict that it should be the Genomic Code; A, T, C and G. We should pay close attention to them in this regard. Dr. Kwan Rim (left) laughs with Amb. 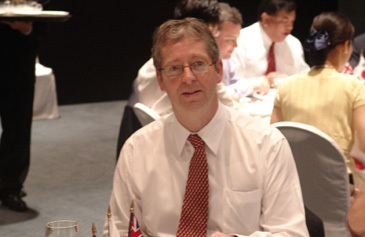 Colin Stuart Heseltine of Australia at ANZCCK August Breakfast Forum held Aug. 9, 2005. Now, there are two groups of nations responding differently to the paradigm shift. One group consists of the nations having large land mass with richly endowed natural resources but are still pursuing the traditional development strategy for industrial society. They include Nigeria, Mexico, Angola, India, Indonesia, Kazakhstan, Russia, Brazil, Columbia, South Africa, Venezuela, etc., and their GDP per capita is less than $9,000 and even lower than $1,000 in some cases. The other group consists of smaller nations with high quality human resources and are diligently engaged in the early development of knowledge-based society. This group include Bahamas, Singapore, Switzerland, Monaco, Belgium, Denmark, Iceland, Andorra, Netherlands, Liechtenstein, Israel, Finland, Luxemburg, etc., and their GDP per capita is over $15,000 and even higher than $30,000 in some cases. Korea's GDP per capita is somewhat higher than $10,000, but she has been stuck in that position, so-called $10,000 slump, for nearly a decade. Evidently, Korea has placed herself right in between the two groups of nations responding differently to the paradigm shift. Korea should start moving soon in the direction of accelerating the development of the knowledge-based economy. Even in the late 1990's when the IMF financial crisis threatened the whole economy of East Asia and Korea in particular, Korea sustained her R&D investment. The amount of R&D investment and the number of R&D personnel have increased rapidly from the 1980's to the 1990's. These investments of sizeable amount for a sustained period fueled the growth of the Korea economy. A number of strategic national projects have been successfully executed during this period. For example, one of the MOCIE (Ministry of Commerce, Industry and Energy) projects, which was carried out from 1987 to 1999 with a budget of $1.08 billion, resulted into a $30 billion gain in the export of memory chips, LCD and HDTV. It is also interesting to note that Koreans seem to possess an inherent dynamic character, compatible with the new digital paradigm. As often noted by foreigners, the words most frequently used by Koreans are "Pali, pali." meaning "Faster, faster." Indeed, Korea has marked the top rank globally in the high speed internet usage and in the number of cycles in changing cellular phones. Presented so for are encouraging stories about Korea. But there are some alarming signs too, which Korean industry will have to cope with. It is clear that the share of Chinese products surpassed that of Korean's since the 1990's. Since then, the curves for the Korean shares have remained virtually flat, whereas the curves for the Chinese shares have been rising rapidly. China instituted innovative approaches, moved towards an open market economy, and joined WTO. A considerable number of the manufacturing plants have moved form Korea to China. Indeed, China has come up to the surface of global market as a "global factory," and sustained a high annual growth rate of 7 percent or higher. On the contrary, Korea's annual growth rate has sunk below the level of 5 percent. Korea as well as other countries in a similar situation are struggling to cope with this paradigm shift, through such measures as M&A, production system optimization, global outsourcing, and the like. Outsourcing may cover natural resources, finance, and even human resources. These are a kind of activities intended to take advantage of the strong networking characteristic of the knowledge-based society. Enhancement of R&D activities in spite of recession is another measure taken by the leading countries of the world as well as some of the newly developing countries like Korea. For example, the U.S. has increased the annual R&D budget by 13 percent and Japan has also done so by 1.4 percent. And Finland has increased the R&D budget by 1.8 percent, although the total government budget has been reduced by 1.4 percent. Some countries including Korea are also trying to enhance their R&D productivity by means of global networking; namely through intensification of the linkage between the domestic R&D work and that of global R&D entities. For example, about half of the national R&D projects are carried out through global collaboration in the case of U.K. It is 25% in the case of Germany and Sweden, and 10% for the U.S. It is only 1.3% in the case of Korea, but we expect that it will increase. EU has been also active in this regard. Since the mid 80's, EU has operated many multi-national co-working programs, such as ESPRIT for information development strategy, ACTS for telecommunication technology development, SEMATEC for pan-Europe semiconductor development, BRTE-ERAM for industry and new materials development plan, THERMIE for energy technology development plan, Socrates for integrated education training business, Leonardo da Vinci for integrated technology training business, and so forth. To facilitate a speedy transition of Korea from the industrial to the knowledge-based economy, it is very important that their human resource development process be accelerated. We need education system for the cultivation of top brains for generation and dissemination of knowledge, re-education program associated with career development, continuing education for citizens to enhance their technology literacy, and so forth. The speed of transition from the industrial to the knowledge-based industry is so fast that, if incumbent workers in manufacturing fail to adapt themselves to knowledge intensive work, a massive unemployment may occur. Additionally, many of the major manufacturing industries in Korea are becoming IT-based automated facilities. Therefore, re-education programs for the unemployed and continuing education programs for the incumbent workers are indispensable in the knowledge-based society. Next, invigoration of technological innovation is important for Korea. After all it is through the process of technological innovation that we can generate wealth, improve the quality of life, and assure national security. Here, we need to emphasize the importance of science and technology plus entrepreneurship. In recognition of this new paradigm, Korean Government has recently committed itself to develop a science- and technology- centered society on this peninsula. Finally, Korean industry ought to try to improve their global competitiveness by international networking. In knowledge management, a high recommended method for increasing and utilizing knowledge assets of an organization is to build up a human resource network. A similar concept is applicable in the global arena as well. As an example, examine the case of IMS (Intelligent Manufacturing Systems) program, which has followed the core concept of the knowledge-based society. IMS is a global network program, participants to which are Australia, Japan, Korea, Switzerland, and the U.S. The primary activities of IMS are co-researches at a pre-competitive stage. Additionally, it offers an education program (GEM) and operates a community of common interest (CCI) in each of an interesting technology area. 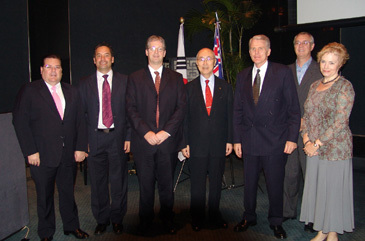 The International Steering Committee of IMS will be located in and operated from Korea for two and a half years, beginning with May, 2005. In conclusion, it is recommended that the Korean industry help accelerate Korea's human resource development process, invigorate technological innovation activity, and enhance international cooperation through global networking. As for the Government's decision to develop a science- and technology- based society on the Korean peninsula, the sooner it is carried out, the more competitive the Korean industry will be. Mr. James (Young-Ju) Huh, who serves as a staff reporter for The Seoul Times, studied management at the Ritumeikan Asia Pacific Universty in Japan. 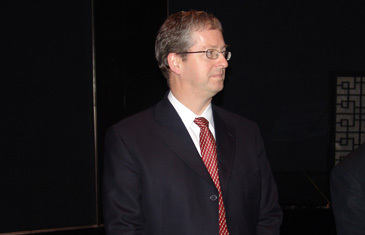 He covers diplomatic area and other foreign communities in Seoul.